The Baccaros purchased "Big Blue" in 1983 from former member Otis Gaston. It is the second car to join our current collection. We know a little about it's early years and a little about the later years but not much of the middle history. It was purchased new in Dallas and was there until the mid 60's when the engine was allegedly re-built by a former Packard Dallas technician. At some point after that it made the journey to Mississippi. Otis saw the car advertised in an issue of Old Cars Weekly and bought it sight unseen. Part of the deal required the seller drive the car from Mississippi to Houston so he would know it was road worthy. It made the trip fine except at an overnight stay at a motel in Louisiana some one dug out the key slot in the door in an attempt to steal it. Something chased them off before they got in and only recently did I acquire a key cylinder to replace the damaged one. When the car arrived, it was a yellowish color that I think Packard called "desert sand". (actually there is evidence that it was originally green) Anyway, it needed painting. Otis planned on painting it a Packard Blue metallic but fell for a bright Camaro blue instead. 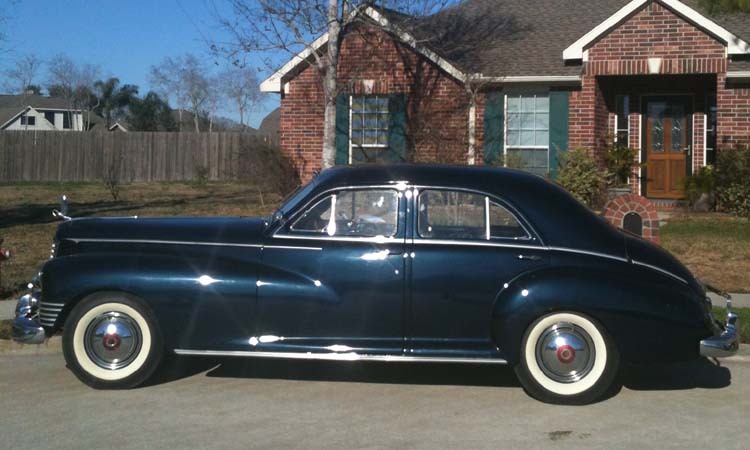 We had a '46 Packard Custom at the time that I was having a lot of trouble with because I was not as diligent as I should have been when we made the purchase. (wrong Packard engine, transmission problems etc.) I was disgusted and when I saw this car I decided I would rather restore it than try to fix everything wrong with our '46. An offer was made of the '46 plus some cash for "Big Blue" and it made the trip from the Gaston's on the north side to our then home in Sagemont with no problems. I was working on the '48 limo at the time and wanted to finish that restoration before starting on the '47 but I never intended for it to take so long. However, two Mustangs, a 55 Packard, and the time consumed at work soon made the '47 a retirement project. I did re-do all the woodgraining in the car as one of the former owners had sprayed it with bright gold metallic paint. It was very presentable exterior wise, ran great, and that Camaro blue did look nice so we did bring it occasionally to LSP meetings. During the 1984 national meet which we hosted, we actually drove it into the hanger at NASA and took a picture of it beside the Shuttle mock up. At the time a close family friend, Colonel Guy Marsella, was head of security and he got us in. Post 9/11 I cannot imagine anyone having that kind of access again. Once I retired I did start working seriously on Big Blue. I have to admit it looked pretty in that bright Chevy blue but it always bothered me that it was not an authentic Packard color. It now is painted a dark metallic blue which is as close to a Packard Blue as we could get it. Actually a night or in the shadows it looks black. In the bright sunshine it is a gorgeous blue and we are pleased. It has been re-wired and new interior has been installed and it sports a new set of Coker Classics purchased from Wallace Wade. We have a few more minor touches to finish but it should be a regular at LSP meetings soon.